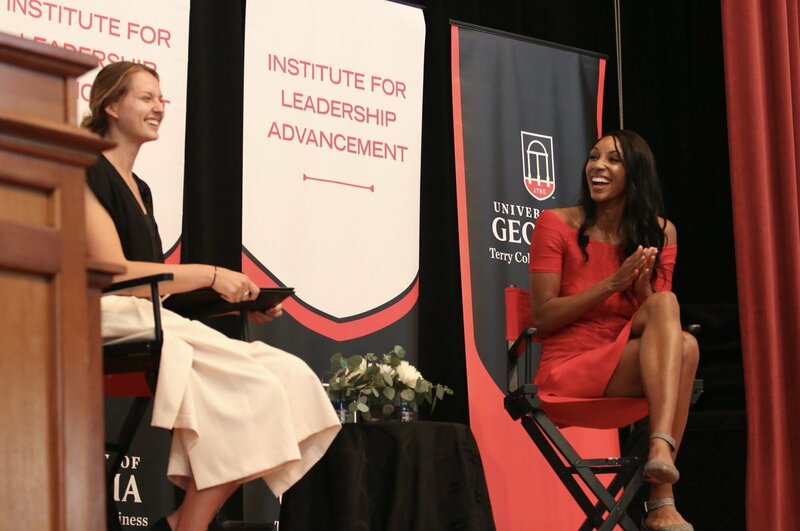 From left: Marketing major Kendall Kazor interviews ESPN personality and Terry alumna Maria Taylor during a Terry Leadership Speaker Series event. As the first African-American woman to co-host ESPN College GameDay, Maria Taylor (ABJ ’09, MBA ’13) is familiar with forging her own path. The secret to breaking glass ceilings, she said at a Terry Leadership Speaker Series event, is to embrace what makes you different. Taylor, who is also a sideline reporter and analyst for ESPN, was a four-time all-SEC volleyball player at UGA and a starter on the women’s basketball team. Taylor pursued her Terry MBA while working in sports information at the Athletic Association. Since graduation, she has been employed by Comcast Sports Network, IMG and ESPN. From the outside, her career arc may look like a perfect upward slope, but it didn’t happen the way she planned. In 2014, Taylor co-founded a nonprofit, The Winning Edge Leadership Academy, to help women and minorities interested in careers in sports. The idea grew out of her own experiences of feeling invisible in her field. The Terry Leadership Speaker Series presented by the Institute for Leadership Advancement. It brings well-known leaders from a variety of organizations to share their unique leadership styles and experiences with students.